as Thanks for the inspiration Logan, and thanks g+ for giving me the tools I needed to spend like half an hour stalking the web to find that guy's name. Anyway. This is just a cute photo of me. In being a system that promotes choice, the AP system should also have ways for you to sidestep the rules. The simple way to do this, by my eye, is to trade things for power. You really, really want that fifth spell after I told you you only had 4AP? Sure thing, but you earn your last AP by giving my your legs. Your horrible cripple character has earned a weird fifth variation of magic missile by giving up the ability to walk, and I like that about them. A very mild twist on this is to have powers with their own limitations. I read a cool thing one time many years ago about huge lists of totally amazing powers, all of which only worked in highly specific circumstances. A charm spell with no saving throw that only works on redheads at midnight. Mass hold person that you can cast from first level, but only if you're standing in a field of barley and it's your birthday. And then the Last Gasp thing got me thinking about clerics and how they'd make a good testbed for a catchall ruleset. Behold an example cleric. 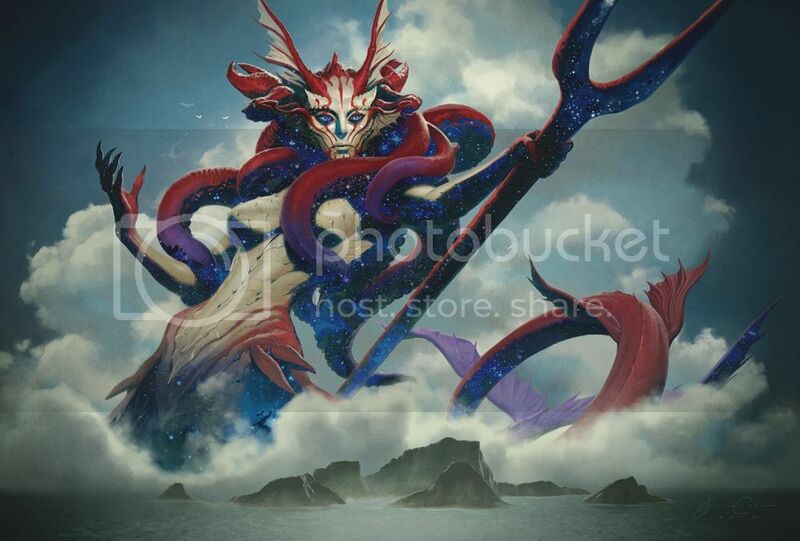 A Vassal of Thassa may, as a standard action, call upon a miracle from their fishgirl godqueen. This miracle can be absolutely anything, from making an anchovy appear out of thin air to drowning the world in briny agony, as long as it's appropriate to their god. The DM will decide on a difficulty for the miracle, with an approximate guide below. Whenever the Vassal attempts to bring forth a miracle they roll a d20. If the result is higher than the difficulty of the miracle + their current Brine, it goes off fine. If the two numbers are equal, then the miracle goes of and there is a Terrible Occurrence. If the result is less there is only Terrible Occurrence and you can hear Thassa going 'wait y r u screaming??' in the background. Regardless of what happens, the difficulty of the miracle is added to the Vassal's Brine. Brine may be reduced by 1 point a day with an appropriate act of worship, down to a minimum of 3. This minimum is also what it starts at at character gen, obviously. This means that you have a 15% chance of horrible failure even before you do anything interesting, which strikes me as a good tradeoff for really broad powers. Speaking of horrible failure, roll on the table below to find out what happens. Maybe if you're nice you can base the die size of how much you rolled under by, or roll a d10 and add what you missed by. I ain't the boss of you. All your gold is sand now. On the bright side, all your sand is gold. Your stomach bulges uncomfortably. At midnight tonight you will birth a clutch of adorable baby crabs. They give you friendly nips with their claws as they climb out of you. All fires in the vicinity are extinguished by a mysterious salty wind. You can't make fire work for you, for any reason, for the next week. Start vomiting eels. Don't stop vomiting eels until you start to appreciate the feeling. That might take a while. Everything goes blurry as your blood is replaced with salt water. Pass out for a while, wake up very, very hungry. You are distracted by a passing swarm of beautiful jellyfish that are swimming through the air for definitely normal and friendly reasons. They totally aren't leading you off a cliff or anywhere dangerous like that. Your whole head starts to ache, doesn't stop until the skin of your forehead bursts like a pimple and a slimy, anglerfish-style lure curls out. Casts light as a candle. Is really distracting. Your left eye is a pearl now. Super valuable if you dig it out. Not so good for seeing out of, though. Barnacles sprout from your skin, tearing at the soft flesh under your arms and between your thighs. It hurts to move for the rest of your life. Coral polyps start shooting out of you like you're a broken gumball machine. Everybody makes a reflex save (except you you automatically fail hahaha) to avoid getting stuck in a new, incredibly heavy coral formation. Everyone in the party must help find and drown an innocent before the next full moon or you'll all start waking up drowned, guiltiest first. Your skin is stingers now. Anyone you touch gets painfully stung and must save v. convulsions. If they fail they save again v. death. There are no visible indicators of this. Whenever you get drunk again, for the rest of your life, you will without fail be pressganged and wake up chained to an oar. No amount of precautions can prevent this. Your blood is super delicious and even things that don't ordinarily smell that good can smell it from a mile away. Doubled in fresh water, tripled in salt. You are being stalked by a prehistoric monster than only you can see. You will not be able to convince anyone else that it exists under any circumstances. It will only strike when you are alone. Try not to be that. The skin of your neck ripples as new gills sprout. Your lungs shrivel up in your chest. You don't need those any more though, right? You should probably find some salt water. Quickly. There is a pufferfish in your stomach. You can feel it, circling around in there. Make no sudden moves. Everyone in 100' turns toward you, grinning. Their eyes are black. Their teeth are jagged and come in many rows. This includes the other PCs, who get a big old pile of bonus XP for each bite they take out of you. Once every scrap of your flesh has been consumed everyone goes back to normal and about their business as if nothing was wrong. You could cast another miracle to stop them all. It's going to be a hard one. Save vs death. On success, tiny fish start bleeding out of your pores. Take an appropriately debilitating amount of damage. On failure, your body convulses, your skin ruptures, you burst apart into a torrent of sea life that rapidly begins to rot away. You are super dead. Save vs death. On success, tiny fish start bleeding out of your pores. Take an appropriately debilitating amount of damage. On failure, your body convulses, your skin ruptures, you burst apart into a horror of the depths, unfolding impossibly from a too-small corpse. You are super dead and the new leviathan is hunting your friends. Hopefully this is a reasonably balanced set of general spellcaster rules that gives you a fun gambling minigame. Will you try to take out the ent in a single 5 Brine miracle, despite the fact that you already have 6 Brine? I mean what's the point of having these powers if you don't use them, right? Oh whoops you just turned a hard encounter into a TPK. lol. So yeah, should give players a temptation to use magic until eventually they get a bad roll and succumb to the dark forces, in a way that nicely parallels the way I already think about succumbing to dark forces. As always, whether you use it or just think about it, tell me if it works! These are the best d20 tables there is. As good as Jason Sholtis' d12 tables.